The designs in Biscotti and Kate Mack collections possess a nostalgic and modern appeal destined to please both the youngest customer and the fashion conscious young teen. Whether the occasion calls for a formal or more casual look, the combination of beautiful fabrics with eye-catching details fills the need for what girls (and Moms) want an outfit to be: hip, but also simple, pretty and modest. 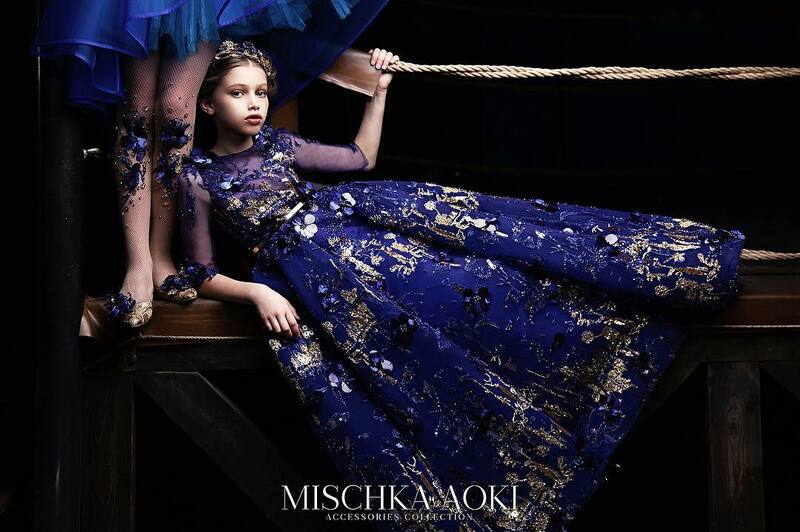 Girls gold jacquard dress by Kate Mack & Biscotti. This opulent style has a fitted, sleeveless bodice, with a gold jacquard weave over a fine mesh fabric. The waist is decorated with pearls and it has an attached, gathered skirt, that has a longer length lace hem at the back. It fastens at the back with a zip and is lined in satin, with a stiff layer of petticoat to add fullness. Calling all princesses! This elegant gold metallic lace dress with pearl encrusted waistline and dramatic high-low hemline is the perfect choice when she wants to feel like royalty! Girls pink sequin top and skirt set by Kate Mack & Biscotti. The sparkly top has shimmering rose gold sequins, long sleeves and does up at the back with a zip and is lined in soft jersey for comfort. The matching skirt is made with layers of soft tulle and is embroidered with rose gold jewels and is longer length at the back. It has an elasticated waistband and is lined in silky satin. Girls pink bolero cardigan by Kate Mack & Biscotti. Warm and cosy, this pretty cropped cardigan is woven in a soft polyester blend. It is decorated around the neckline with pearls, jewels and floral appliqué and fastens with a single popper. Girls dusky pink, floral tracksuit by Kate Mack & Biscotti, made in a soft cotton jersey blend with a pretty all-over floral pattern. The hooded top has a smooth, suede panel on the front with working zips at the hem. On the front, there are glittery, rose gold sequins in the shape of a heart, and a soft velour bow with a jewel appliqué. The trousers have two back pockets, an elasticated waist, and a stunning panel of rose gold sequins down the side of the leg. 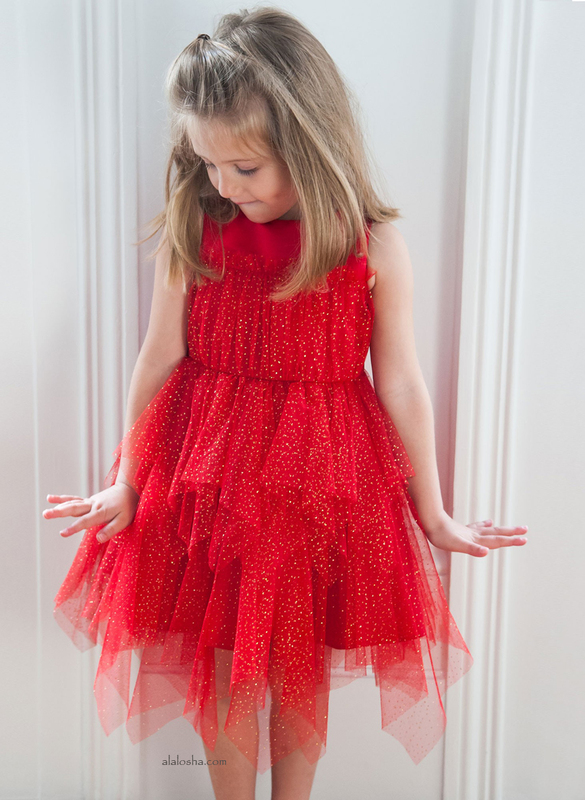 Girls gold jacquard dress with tulle skirt by Kate Mack & Biscotti. This opulent style has a fitted, sleeveless bodice, with a gold jacquard weave over a fine mesh fabric. The waist is decorated with pearls and it has an attached tulle skirt, with layers of gold and ivory tulle strips, that have a full and frothy effect. It fastens at the back with a zip, has a tulle waist tie and is lined in satin. Your young starlet will be red-carpet ready in this stunning dress combining a golden metallic lace bodice with a skirt completely covered in netting ruffles! Shimmering pearls at the waistline add an extra measure of wow!